From British classic to Caribbean icon, Moke has become a symbol of fun in the sun. Introducing Moke America: A 20th-century collectible car reinvented with 21st-century green-friendly electric power, available exclusively in the USA. 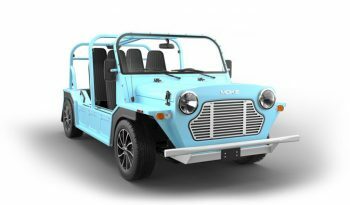 The biggest components of the Moke are made in America, including the glass, seat belts, tires and batteries. All ten batteries are made in America. The product is assembled here on American soil. If you have a problem with the batteries, we have them right here on the shelf. It’s easy to use, easy to wash. The whole car can be hosed down, inside and out. We offer a Bimini top so you’re half outdoors, half indoors. The look and design is better than the original because it is longer, wider and closer to an American car. A 20th-century collectible car reinvented with 21st-century green-friendly electric power, available exclusively in the USA. + added options, applicable fees & taxes. I am interested in some more information on the Moke. Please contact me at your earliest convenience.